Taylor was born and raised in Arlington, TX, where he began playing soccer at a young age. He has enjoyed success across all sports in his career and has played against, and with some of the top athletes in the nation, in football and soccer. Taylor was a part of the soccer team that set a high school record in wins and goals scored. Taylor went on to play soccer at UT Tyler where he received All-Conference honors and led the team as captain. He decided to pursue his career in strength and conditioning to help young athletes reach their peak physical potential as they begin to reach high school so that they can build on their athleticism with skill to be the best possible athlete. 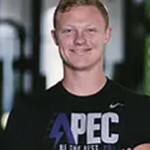 Taylor started his coaching career at APEC head quarters in Tyler, TX. There he coached all levels of athletes and was an integral leader for adult spherical fitness. Taylor also carried the title of Youth Development Coordinator. Taylor comes to Fort Worth with a wealth of experience and passion for people to succeed. Taylor Nelson-Cook has experience with NFL, MLB, and professional soccer athletes. In addition, he has aided in producing six Division 1 gymnastic athletes along with several All Americans.